After cutting back our peonies a few weeks ago, we started to notice a sprinkled crystal-like pattern webbing across the leaves of our plants. It was clear that these signs were a signature of a fungal pathogen, from the family Erysiphaceae, commonly known as “powdery mildew”. 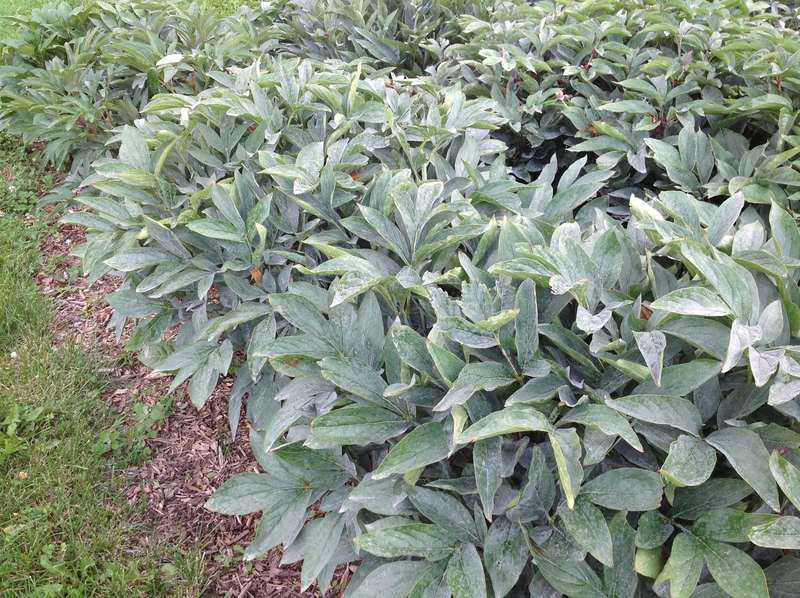 Referencing the University of Minnesota’s Extension website, the most common powdery mildew species found on peonies is Erysiphe polygoni. The webbing is a part of the fungal body, made up of hyphal threads, known as a mycelium. While the mycelium could potentially interfere with photosynthesis and eventually lead to yellowing of the leaves and leaf drop, it usually does not kill a peony plant. In spite of this however, it still may be an aesthetic turn-off to peony growers. The pathogen being discussed, powdery mildew, could easily be misheard and mistaken as a completely unrelated pathogen known as “downy mildew”. Don’t let this confuse you, as there are clear biological and habitual differences that separate the two. First of all, even though they are both commonly known as “mildew”, powdery mildew is a true fungal pathogen and downy mildew is a part of a clade, known as the stramenopila, under the class Oomycota and a part of the family Peronosporaceae. While many common gardeners may not be familiar with this class, most people have heard of the epic Irish Potato Famine, which was caused by the Oomycete species, Phytophthora infestans. Biologically, Oomycetes are distinguished from fungi as they are diploid organisms that have cellulose based cell walls (cellulose is what makes up a plants cell wall) and produce mobile spores that move via two flagella (flagella are small tail-like projections that help an organism orient itself and move through liquid mediums). In contrast, fungi are generally either haploid or dikaryotic organisms, that have cells walls generally composed of chitin, and produce reproductive spores with a single flagellum if the spores have one at all. Both downy mildew and powdery mildew love humid environments, so planting in a well ventilated area or pruning plants in order to increase air flow throughout the vegetative canopy may help prevent such disease infestations. Where the pathogenic preferences start to diverge is the temperature of the environment. Downy mildew, along with many other Oomycetes, generally thrive in cool damp conditions with visual water present in order to aid the dispersal of its spores. Powdery mildew spores (asexual) are spread by the wind, in which a heavy rain could potentially prevent its spores from spreading. Early signs of powdery mildew look very different than that of down mildew. 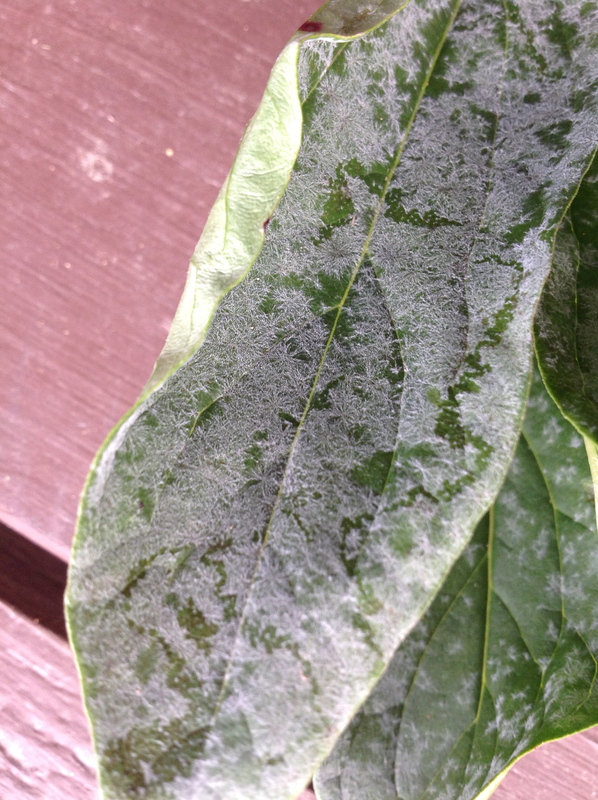 If you dislike the look of the powdery mildew dusted leaves or happen to notice that your plants look a little sad, you may choose to control the pathogen with a simple home-made remedy spray. There are many recipes that include a combination of ingredients such as various vegetable oils, baking soda, compost tea, and even milk! In one of our research greenhouses at the University of Wisconsin Madison, powdery mildew if commonly found on cucumber plants grown by researchers. The greenhouse staff often uses canola oil when signs first appear and switch to using sulfur when conditions become more severe. Whatever solution you choose to use on your plants, it is recommended to alternate between different solutions as to prevent the pathogen from becoming resistant to the treatment. 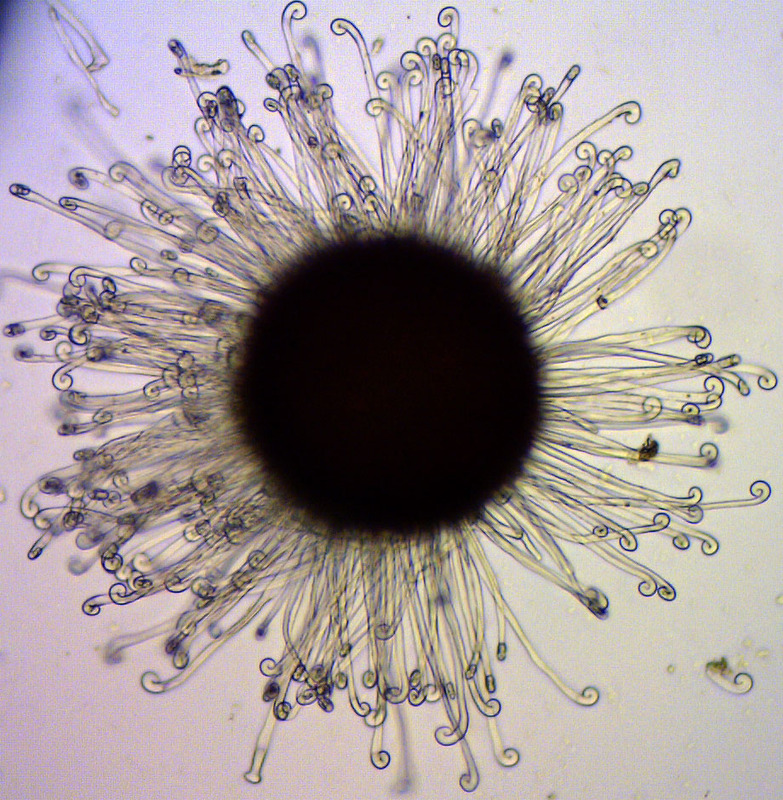 Powdery mildews create both asexual spores throughout the season and sexual spores at the end of the season. In order to prevent future problems with powder mildew, remove clutter and fallen vegetative debris from the ground. 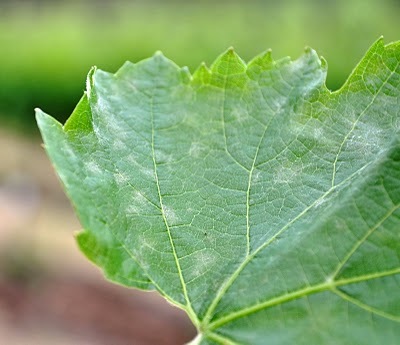 Both powdery mildew and downy mildew families have a wide host range and may economically affect the viability of a grower’s crop on plants like grapes vines and cut flowers. Yet, you may be relieved to know that each separate species of powdery mildew is host specific. Meaning, if you find powdery mildew on your peonies, it will NOT move to your roses or any other plants in your garden. If you happen to find powdery mildew on two different types of plants, it is most likely that they are different species. Finally, if we find either of these pathogens in our grape vineyard here at WMARS, we’ll be sure to post a blog about that too!